Off Grid Modern Prefab Talks Community, Land And Turnips. Off grid, in a net zero prefab house in the heat, this time of year I open the windows at night, close them at daybreak, and use the HRV for fresh air exchange without letting in the heat. When we're in the room we also turn on the fans to help circulate air, and open the clerestory windows to let hot air escape. People ask how we ended up here, in population 40. When we found land that fit the synopsis, above, Handsome Husband drove out, texted me pictures, and I said, "GET IT!!!" "Don't you even want to VISIT IT?!?" "NO! Put in an offer!" So the first time I visited our beloved land was the day we purchased it. I remember sitting in the realtor's office, handing them a check and saying, "NOW let's go see OUR LAND!" You can buy a house, you can buy land, but even with due diligence you never know what you're getting regarding neighbors, the community. WE HIT THE JACKPOT. Today's summer in the south was brought to you by Holiday Lake State Park. So cool it's just down the road! This time of year is for solar cooking. This is also the time of year you help friends pick up hay. We unloaded and stacked 133 bales of our own then headed out to pick up 550 more for a friend. It is hot, hard work but rewarding. 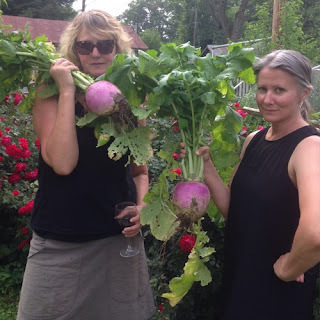 Remember that humongous turnip Sister and I unearthed? Y'all. When life gives you turnips, make hash browns. Pip 2 continues to work with Project Pony. He's scared. But he's coming round. For three days she tried to catch him. So when he was *finally* caught and she realized, tacking up, she was missing a leg strap and stirrup, that was NOT going to stop her! Off she went. Ride on, chile, ride on. Pip 1 is off to UVA Track Camp! He reports that he is loving it, and even placed in a few meets. Which is cool considering HE HAS NEVER RUN TRACK, ha. He also reports that we have failed him as parents as he has NO IDEA who ANYONE in sports is and his new friends can't believe he doesn't know who LeBron James is, etc. Meh. Fifty people were killed, and the nation wept. Let's go back to community. Helping friends pick up hay. Routing out evil was never done gently. Each of us is a tool - it's up to us to keep community whole, healthy, vibrant. Community is made up of many, and we are different. But without all those different systems, we lose function. Think about your body systems, so different, yet all critical- aren't we all? To be community, one must acknowledge and work under a common culture. As much as we love and celebrate our individualized ecosystems, without a parent biome there is nothing. When you face evil, the least you can do (and it is your duty) is stop it. When you shut your door and save your own, that evil will just lurch on until it can latch on to another. It's up to all of us to recognize those people, and squelch it. In order to survive cancer, a tumor, you don't hug it closer, you scalpel and radiate it out and extinguish it. Don't give evil an inch. In all these instances, the community was failed because individuals didn't stop, address, stamp out the obvious. When people enter your presence, embrace your commonalities. Differences are forever important, colorful, vibrant. But it's our claiming each other, and having a common core, that surpasses all, to be community. Going back to the cancer analogy, there's a reason a common word used is: eradicate. It's simple: eradicate evil. Encounter someone toxic? Kick 'em out. Evil? Accountability is key, address it even more severely. As we mourn, let's start the week with love, and vigilance.